Citation Information: J Clin Invest. 2019;129(1):150-162. https://doi.org/10.1172/JCI121372. Pyrin is an inflammasome sensor that promotes caspase-1–mediated pyroptotic cell death and maturation of proinflammatory cytokines IL-1β and IL-18. Familial Mediterranean fever (FMF), an autoinflammatory disorder, is associated with mutations in the gene encoding pyrin (MEFV). FMF-knockin (FMF-KI) mice that express chimeric pyrin protein with FMF mutation (MefvV726A/V726A) exhibit an autoinflammatory disorder mediated by autoactivation of the pyrin inflammasome. Increase in the levels of TNF are observed in FMF-KI mice, and many features of FMF overlap with the autoinflammatory disorder associated with TNF receptor signaling. In this study, we assessed the contribution of TNF signaling to pyrin inflammasome activation and its consequent role in distinct FMF pathologies. 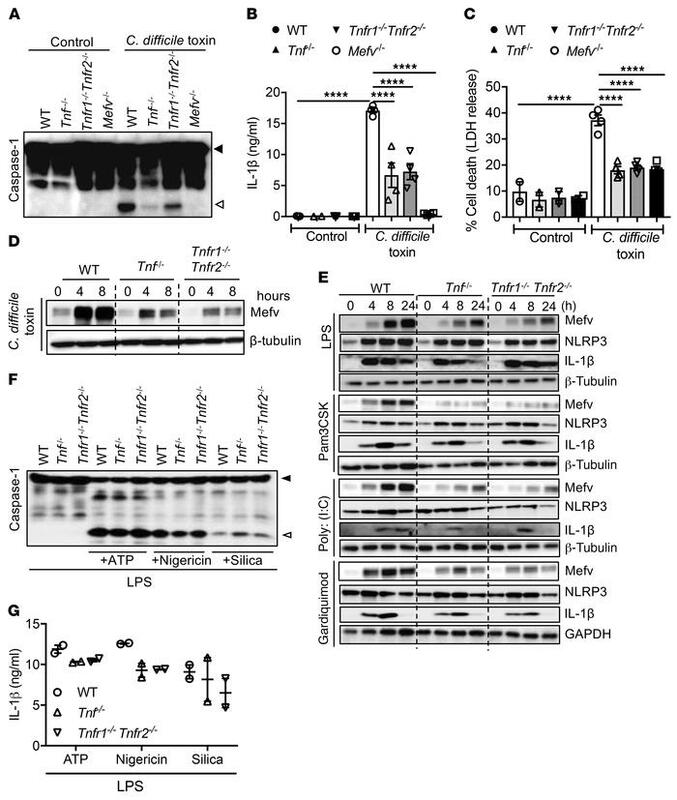 TNF signaling promoted the expression of pyrin in response to multiple stimuli and was required for inflammasome activation in response to canonical pyrin stimuli and in myeloid cells from FMF-KI mice. TNF signaling promoted systemic wasting, anemia, and neutrophilia in the FMF-KI mice. Further, TNF-induced pathology was induced specifically through the TNFR1 receptor, while TNFR2-mediated signaling was distinctly protective in colitis and ankle joint inflammation. Overall, our data show that TNF is a critical modulator of pyrin expression, inflammasome activation, and pyrin-inflammasomopathy. Further, specific blockade of TNFR1 or activation of TNFR2 could provide substantial protection against FMF pathologies. TNF signaling promotes pyrin expression and inflammasome activation. (A) Caspase-1 processing, (B) IL-1β release, and (C) LDH release in BMDMs in response to C. difficile stimuli for 24 hours. (D) Pyrin expression in BMDMs in response to C. difficile stimuli. (E) Pyrin, NLRP3, and IL-1β expression in BMDMs following TLR stimuli LPS (TLR4), Pam3CSK (TLR1/TLR2), poly(I:C) (TLR3), and gardiquimod (TLR7). (F) Caspase-1 processing and (G) IL-1β release BMDMs in response to LPS priming for 4 hours followed by ATP, nigericin. or silica for 30 minutes, 2 hours, or 12 hours, respectively. (B, C, G) Data are presented as mean ± SEM and are representative of at least 3 independent experiments. ****P < 0.0001 compared with WT, 1-way ANOVA followed by Fischer’s LSD test.